ये जीना भी कोई जीना है लल्लू ! : Avatar - Wow!! There are few movies that make you laugh, then there are few that make you cry, all sort of movies, bollywood masala flicks to hollywood sci fi movies. 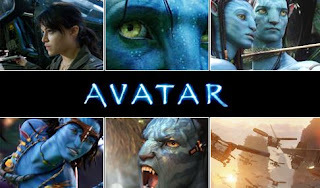 Avatar by James Cameroon deserves a special mention here, it is one movie which is well ahead of its time. You have to see the movie at least twice to hold the grasp of all the subtle points which it conveys so brilliantly. And beautifully. The message is simple though. Give respect. To mother nature, to other people and to yourself. For the first time in movies I guess, earthlings are shown as a nagative character against a good alien clan. Avatar rings a bell that while there's still time, let's WAKE UP and do something - not that we are not doing anything to save earth - substantial to save our planet. Love life. Respect nature. And kill your greed. I shall stop my pravachan on Avatar here, leaving the task of reviewing to lame experts. रब्बा तेरा हुलिया पता है मुझे!